How to recover your Radio Code. holding down the #1 and #6, turn the radio ON, and the serial number is displayed in 2 parts. Only works after the radio says CODe on the display. 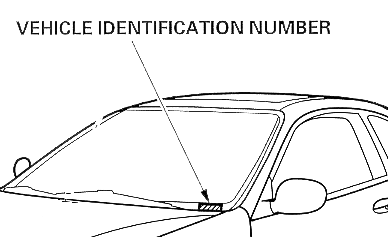 Record your vehicle Identification number. If you are not the one who bought the car from the dealer and have not updated your information you should do so. Visit http://www.ahm-ownerlink.com/ But for now lets continue. This will take all of 5 minutes and all of YOUR information will be recorded with Honda. This is also FREE you should not have to pay for your code..
Re: How to recover your Radio Code. haha I think this is our third, how to find your radio code thread.. Someone should remove the Sticky where you request and Sticky this instead. Since 2000 or 2001, you can hold down the #1 and #6, turn the radio ON, and the serial number is displayed in 2 parts. Only works after the radio says CODe on the display. Works on most in those early years, works on all since about 02. Edit: dangit, I changed the text but the link didn't change....redo. ^thanks for adding that..I will input it to the top.. This thread has been stuck, the other thread has been unstuck and locked on a trial basis. The large thread has been allowed to remain open, because it contains the majority of radio code requests; however annoying seeing it bumped can become, it's better than constant new requests. If new threads for radio codes begin popping up again, I will reverse the changes to the big thread. ^ CALL HONDA with the number above, Its an 800 number..not sure if you will still be charged long distance but call them and they will help you..
No Problem..everything needed is posted above.. There are many ways for an owner to obtain the radio code for themselves. Sticker/card/books, Honda website, the customer service number, etc. If one can't figure out how to do it for themselves, then they should be prepared to pay a fee for the service. Proprietary information doesn't have to be free. ^ Read the original post... that is about all the help anyone can give you. provide serial number or U&L code. Im not online on this forum everyday but PM works as well and it will send a notification to my phone. I hope im not stepping on anyones toes here, but i joined this forum to help and if I can I will. PLEASE!! Read the Original post. I think their may be a person or two that may still be willing to look but its rare(and partially illegal). So please follow the above posts. I can get codes. VIA email only please. ^i will start pointing people in that direction then. Thanks. Who knew that it was so hard to read... That number worked like a champ! I just bought a used 2012 Honda Civic with no radio code visible. I checked the glove compartment, all the stickers around all the door jambs, the trunk, etc. All I can find are a bunch of VIN stickers and the ones for the tires and the vehicle weight. This Civic's radio has no display of its own. It uses the car's display on the dash. I cannot get the "code" text to display, and tried depressing the 1 and 6 while powering up. There is not a hint of a response. The car and radio are working fine, but eventually, I'll need a battery. Is it possible that this radio does not have that function. This is an LX. (USA) 2012 LX does not have a locking radio. I had no sticker in the glove box for my 2002 civic but the door had a code and I entered that and it is working now! I have tried different approachs to find my radio code and none have worked. Now post your credit card numbers so I can collect my fee! Could you please help me to get the code for my radio. I bought my car in a sale (copart) and i dont have the zip code and phone number for the first buyer. I'm in Guatemala city. someone could help me be grateful for life, I have the radio code and I live in Guatemala, if someone can help me here is the info of my CIVIC. I also have a similar problem and I needhelp%u2026 I bought a home used Honda civic and the radio is nowdemanding for a code after I had some issues with the battery. Good god. Many are not even capable of reading usernames?!? Gearbox have not been around for a while. not even in this thread. buy glasses, people, or you will not even be able to read the serial numbers. dumb and unable to read... whats the point in replying if you cannot even read? With your serial number and vin handy. Quick Reply: How to recover your Radio Code.